THE WIFE and I have a friend who has a "Fiance" who we have never met. We decided he is imaginary (not that there is anything wrong with that). THE WIFE shared this theory with her about her one true love "Darren" who happens to be an excellent Roller Dancer (not that there's anything wrong with that). Anyway as THE WIFE spoke to her on the phone I began to share how I viewed the conversation. 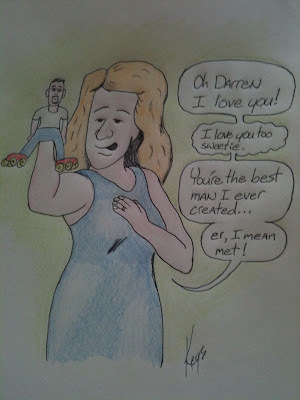 Basically I saw her and a little hand puppet who she named "Darren" (not that there's anything wrong with that) and dressed in little roller skates (not that there's anything wrong with that) so she could express her undying love. Of course, this was the result in my head. High And To The Left!